After 8 days at sea I have docked in St John’s Newfoundland to prepare for my first trans-Atlantic crossing with the new junk rig. Eight days may seem like a lot of time to transverse 500 sea miles and it was – but due to lack of performance of the rig but simple due to a lack of sailing wind. I spent days wallowing in around in light and fickle zephyrs or simply no breeze at all in both the Cabot strait and along the south shore to the Avalon peninsular. This experience taught me a great feature of the junk rig – they accommodate deep sea calms a lot better than my previous sloop rig. On the sloop rig I would have to drop all sail in a dead calm as the rolling of the boat in the swells would play havoc with the main sail causing it to whip from side to side, despite being sheeted tight. This whipping would send stress energy through the shrouds reverberating throughout the boat. It was like living in an em-battered shell waiting for something to break. The only option was to drop all sail and suffer more severe but less stressful rolling. This junk junk rig changes the playing field when dealing with deep sea calms. 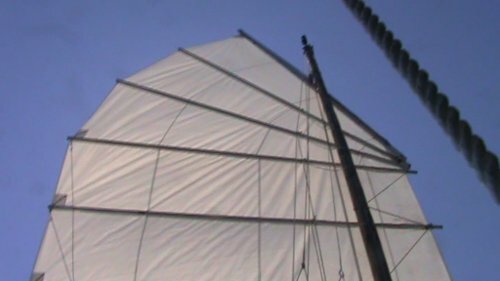 I can now fully hoist both sails and no ‘whipping’ is experienced largely due to the battens but also due to the points of pressure being spread out through batten parrels the length of the mast and the sheet spans up and down the leach. The effect is a gentle and calm swaying in the swells with no stress being transmitted to the rigging, hull, or my self. It’s still frustrating going nowhere for hours, indeed days, but it’s a lot easier to suffer in the junk rig. On two occasions on this first sea-trial I slept soundly for 8 hours while the boat, with fully hoisted sails, rocked gently in the swells. This would have been virtually impossible in the previous sloop rig. The rolling in the swells and inevitable creaks and rattling of everything on the boat (or so it seemed) would often prevent me from getting much sleep at all. But it’s not all roses. This 500 mile sea trial has indicated some serious weakness in the current set up including chaffed out sheet spans and insufficient main mast partner and wedges. All to be sorted before my departure to Cork Ireland next week. I will discuss the issues in more detail in the next post and hopefully get some feedback. But for now my Tim Horton’s coffee is finished and it’s time to get out and about. This entry was posted in junk rig, junk rig design, junk sail and tagged dead calms, deep sea, junk sail, mast, parrels, partners, sea trials, wedges. Bookmark the permalink. good luck with your crossing next week.. hope the jet stream will be on your side.